Picturit: This was something else and so well kept. I think they have to maintain these colours and and cannot change it. A seriously gorgeous image, Astrid. I like the novel solution to avoiding scraping the boat's side. I am so glad you were finally able to see this novelty of the Venetian lagoon, Astrid. Totally worth the experience, right?! Picturit: You know I love boat rides so this was a treat over and over. The colourful houses are a delight and wonderful to see. A strange but pleasing place Astrid, a mini Venice. I like your shop, what do you sell? Somewhere I've always wanted to go to; a photographers dream. 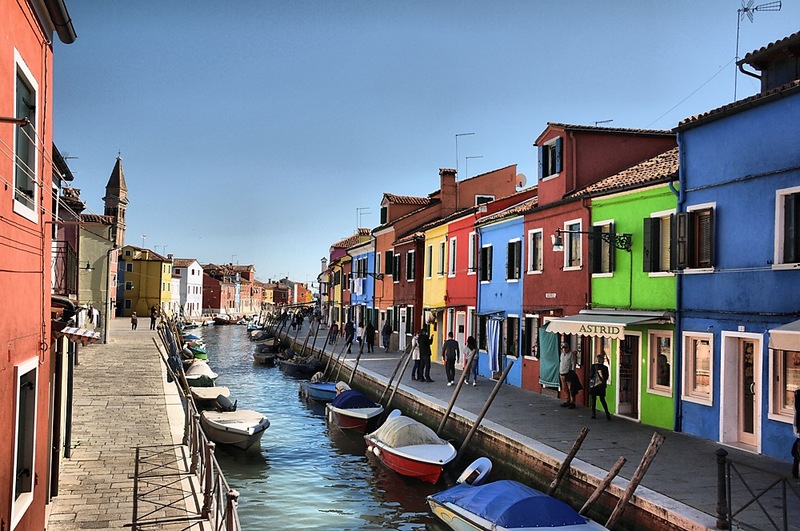 I love the colours of the houses and the watery "street"; no "jay walking" there! Picturit: We were so happy with the weather and it was a delight to 'finally' walk in the famous town. In real life it is much smaller than I imagined. HA, mayby at night after a few drinks some might go 'jay walking' for they think they can 'walk on water'... HA..
a wonderful scene with all the colourful houses! Picturit: Have you been here, Philine. It is worth the trip with the Vaperatto. I love this island, and I note that the Astrid shop is the brightest. How appropriate. Great picture of this lovely place. C'est magnifique avec ces maisons de toutes les couleurs. Picturit: We thought so too, Martine, thank you. Some places that have colourful row houses like this call them 'jelly bean houses'. Quite a sight isn't it. Picturit: I love the name for those houses, It is wonderful, I really loved it. What a beautiful boat Friday!! Love your shop! Who wouldn't love to have a walk along there, it is a colour photogrphers delight. Picturit: This is the right word 'colour photographers delight'... it is and I was impressed with it. Looks almost like a toy town! Picturit: It felt like a toy town... so small and so wonderful. a remarkable shot of this place, Astrid. i see that the light is coming from the right, yet the buildings to the right of the canal are somewhat glowing. Picturit: It was very difficult to get a proper picture of these houses, the sky was so bright and the sun so bright too and the shade was so 'shady' that I had to 'lighten up' the picture a little, something I normally never do, but in this case I needed it. Do they get many drownings in the canals, Astrid? Picturit: Thank you so much, Larry. It was a delight to see this kind of houses all over. What a place and what a picture. One day, I may go here. Picturit: I think you and your wife will enjoy it (don't go in high season though). Philine will go there again in a few weeks. Such beautiful color you've captured here, Astrid!!! And everything looks so clean! Picturit: It was spotless. I have to say that they really maintain the city and such a difference with the houses in Venice, which had a lot of water damage.